Today is my final post highlighting our recent trip to the Netherlands! 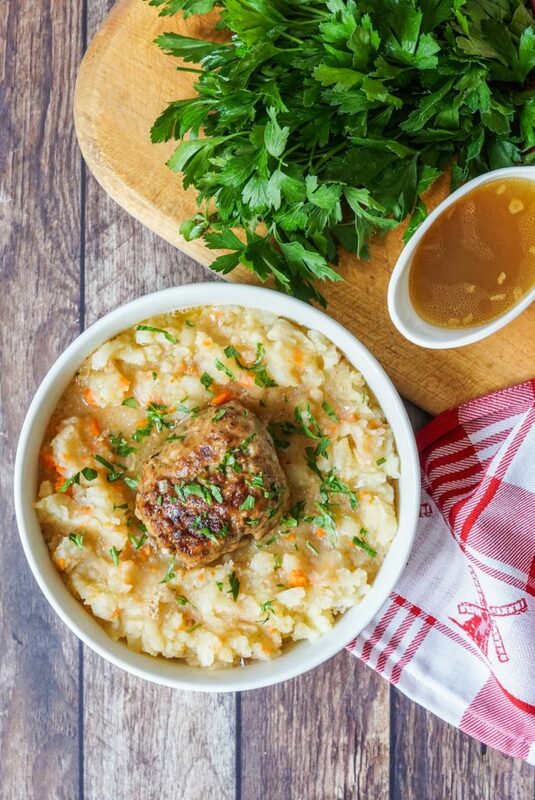 I will be covering the Rijksmuseum, Anne Frank Huis, food and shopping, and a recipe for Hutspot met Gehaktballen (Dutch Mashed Potatoes and Carrots with Meatballs). 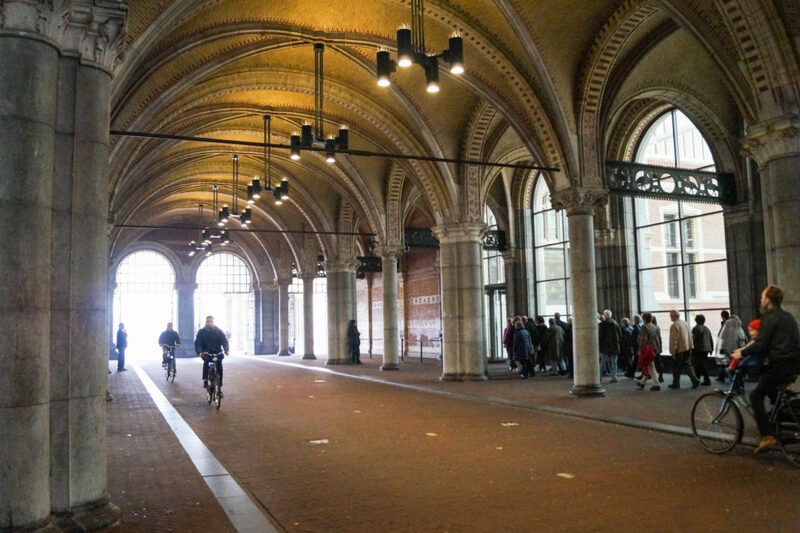 Disclosure: I received entry to the Rijksmuseum in exchange for featuring the museum in this post. All comments and opinions are my own. One morning we stopped at a bakery called Bakkerij Van Toor. It was just across the street from our starting point on Tram 1 (Ecuplein) before traveling into the city center. 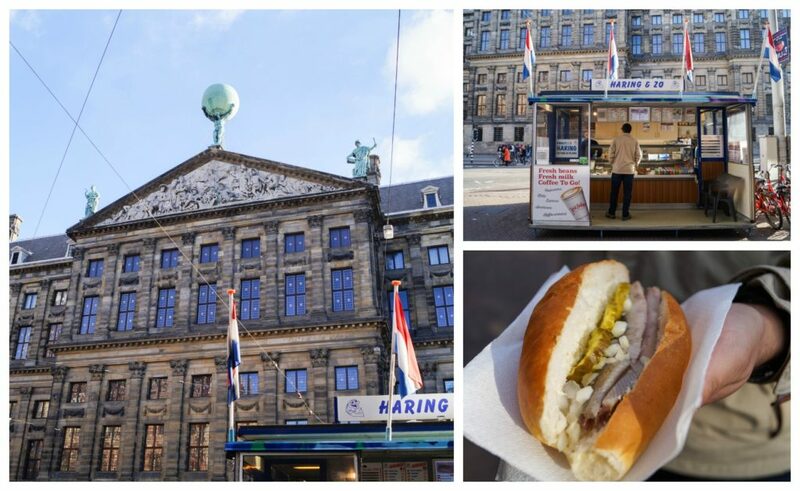 They had a variety of fresh sweet and savory treats available including Oliebollen- deep-fried doughnuts popular during the winter and particularly on New Year’s Eve (left photo above under the Bakkerij Van Toor sign). Claire’s favorite was the bagel with a pizza topping. We also enjoyed a pastry swirl filled with cheese and Saucijzenbroodjes. After breakfast, we hopped on Tram 1 and took it to the Stadhonuderskade stop. From there, it was just a short 6 minute walk south to the Rijksmuseum. The Rijksmuseum is located southwest of the center of Amsterdam along the Museumplein. 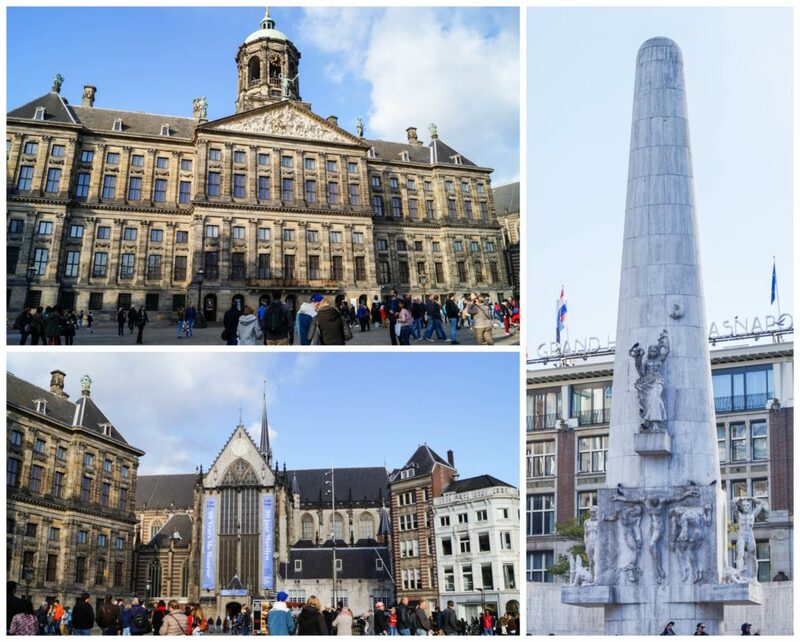 It was first created in The Hague in 1800 and was moved to Amsterdam in 1808. The current location opened in 1885. 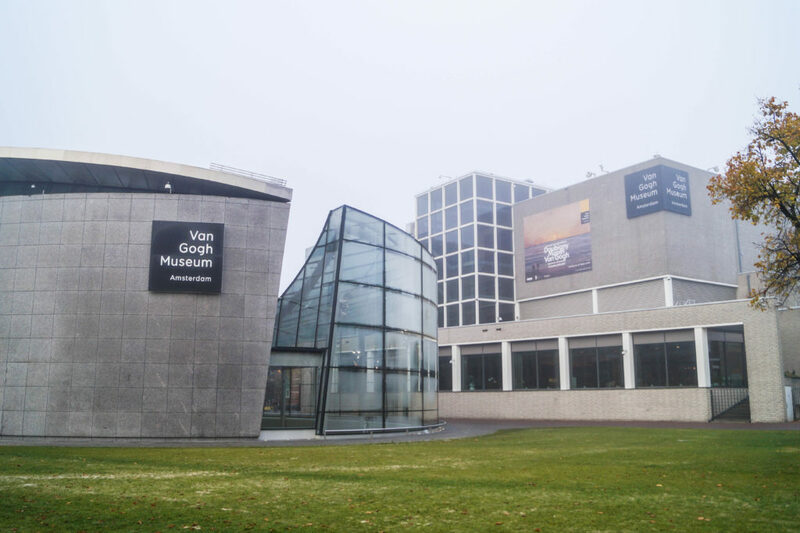 The museum was closed for a major 10 year renovation from 2003 to 2013 and is now the most visited museum in the Netherlands. 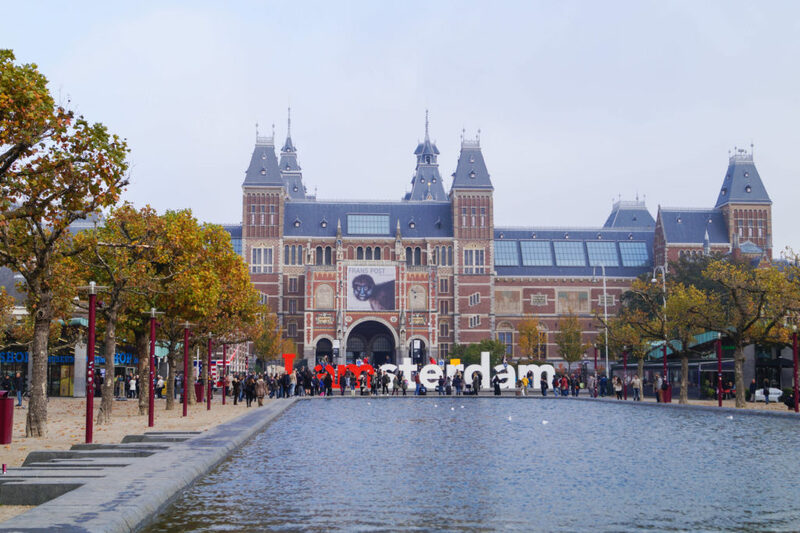 In front of the Rijksmuseum is a beautiful reflecting pool and large I amsterdam sign. If you can get through the crowds, the sign is great place for a photo op. The museum is open every day of the year from 9 am to 5 pm. Ticket prices are currently 17.50 euro for adults over the age of 18. Admission is free for those 18 and under and Museumkaart holders, members of ICOM, ICOMOS, UNESCO, the Rembrandt Association (Vereniging Rembrandt), KOG, Vrienden van de Aziatische Kunst and Vrienden van het Rijksmuseum. Tickets can be purchased online in advance to avoid the ticket lines. This museum along with the others in Museumplein are incredibly popular and tend to get very crowded. We were there during the off-season with gloomy weather and crowds started to increase, particularly at the ticket counters, around 11. On heavy traffic days, those with a ticket may still have to wait in a queue outside the museum (during the holiday period, bank holidays, and weekends between 11 am-3 pm). Try to get there first thing in the morning if possible. Strollers and cameras without flash are allowed in the museum (there are elevators available and baby changing stations in the restrooms), but bags and coats need to be checked across the hall from the ticket counter. 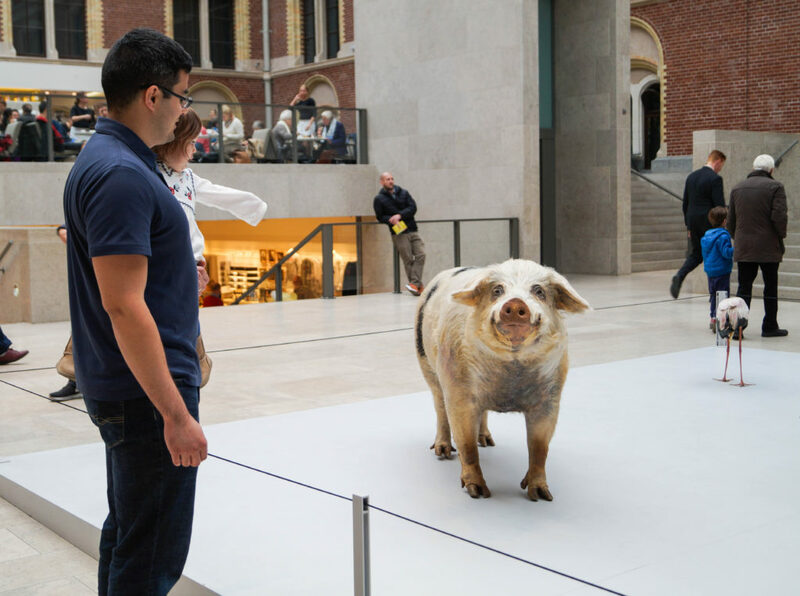 I generally don’t associate famous museums as a place that would be child-friendly, but I was pleasantly surprised with how much the museums and other attractions in Amsterdam went out of their way to cater to younger children and families. After purchasing your tickets, you can visit the information desk for a pamphlet geared towards children with activities and a map of exhibits that may be the most interesting for this age group. You can also pick up an activity guide for the 17th century for children 8 and older at the ticket desk or museum shop for 12.50 euro. There are also special guided tours for families, regular workshops, and free drawing in the picnic room (this room is a great place to relax and take a break with younger ones). Before viewing the exhibits, we stopped by the café just inside the museum for a bite to eat. 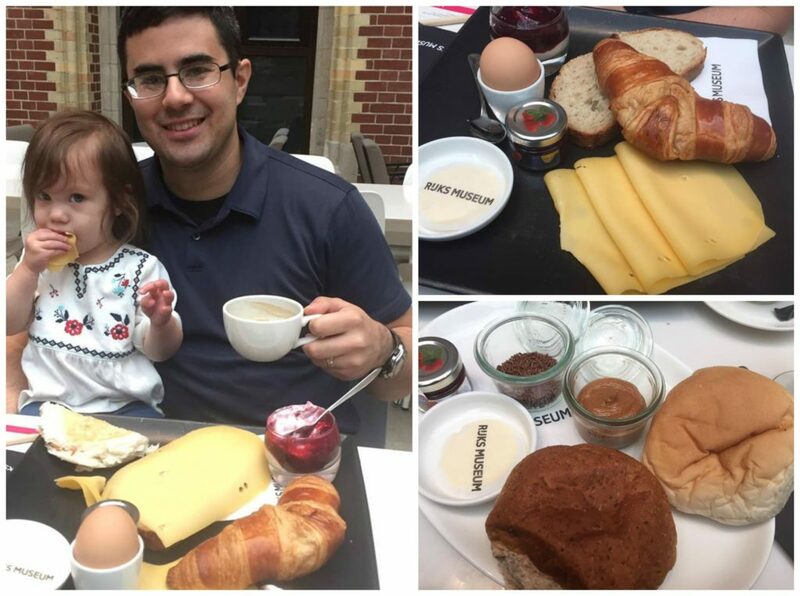 The Rijksmuseum Café is open from 9-6 and offers an assortment of breakfast items, sandwiches, soups, and salads. Evan and Claire had bread with pindakaas (peanut butter) and hagelslag (sprinkles). Chad and I shared a spread with bread, a croissant, parfait, egg, and cheese. There is also another restaurant with a terrace called RIJKS®. It is open daily from 11:30 am to 11:00 pm. 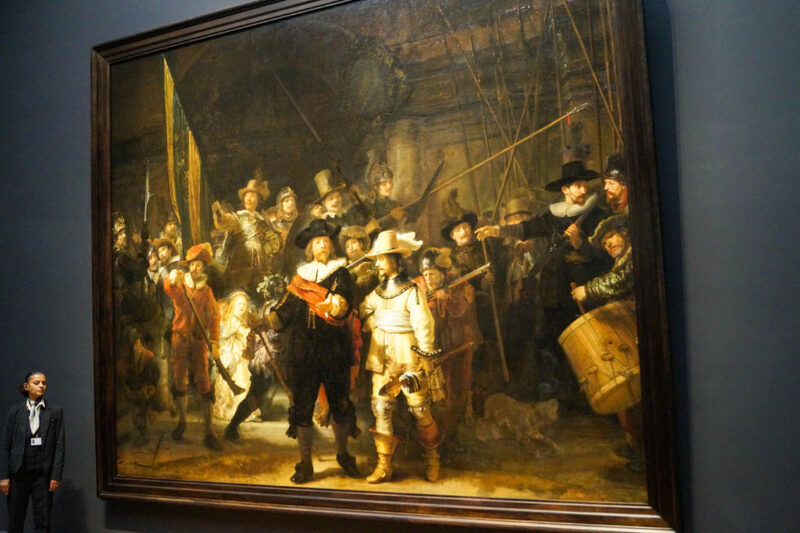 The highlight of the museum that everyone tends to flock to first is Rembrandt’s 1642 painting, De Nachtwacht (The Night Watch)- Militia Company of District II under the Command of Captain Frans Banninck Cocq. It is on the second floor along with other famous paintings from Vermeer, Steen, and Hals. 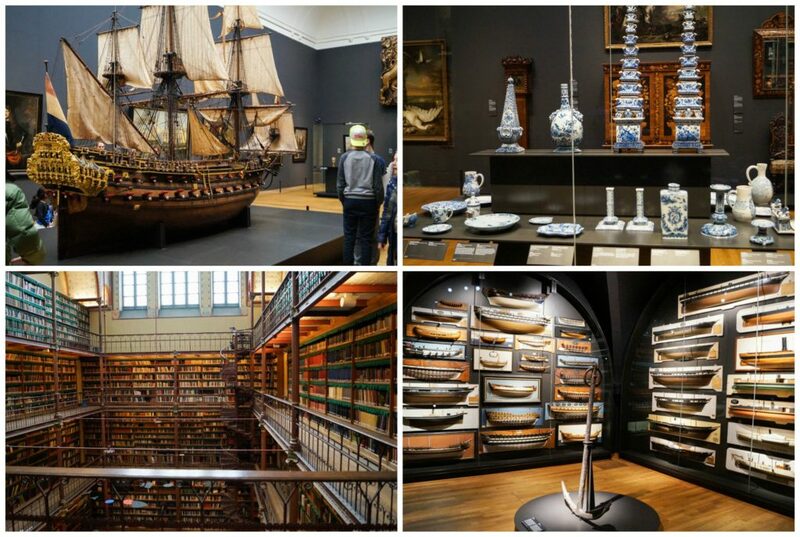 There is much more to the Rijksmuseum than famous paintings. The massive building is home to over 8,000 historical objects on display (the museum owns about 1 million). It also houses the Cuypers Library (photo above- bottom left)- the largest and oldest art historical library in the Netherlands. The library is open to visitors with free wifi access and iPads available for general use. 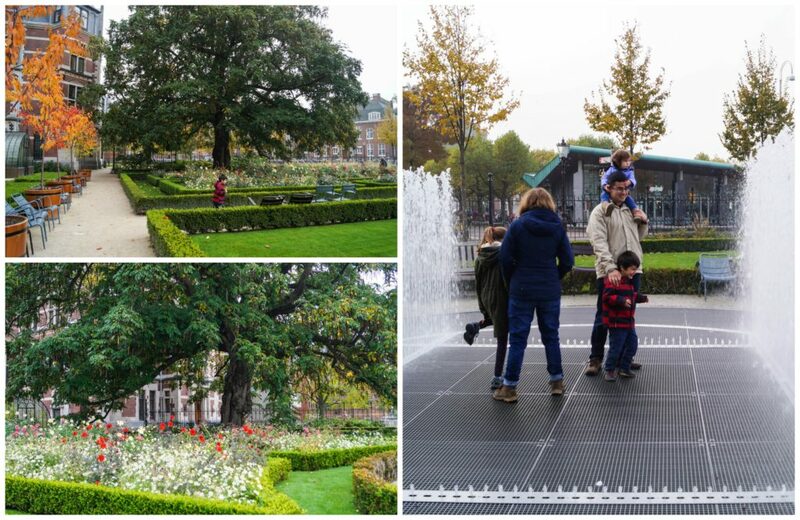 Just outside of the Rijksmuseum is a beautiful garden to get some fresh air. The kids loved being able to walk through the fountain. Make sure you time walking through the jets correctly. It was quite chilly when we visited and witnessed an unfortunate visitor get soaked. Along with the Rijksmuseum, the Museumplein (Museum Quarter) is home to two other famous museums (the Van Gogh Museum and Stedelijk Museum) and the Concertgebouw (Concert Hall). We had planned on visiting the Van Gogh Museum too, but ended up running out of time and the ticket lines were packed by the time we left the Rijksmuseum. From the Rijksmuseum, it is an easy 10 minute ride on Tram 5 or 20 minute walk to the Royal Palace. Another food item on our list of things to try was raw herring (haring) and we found a stall right behind the palace. Chad got a sandwich with the herring, raw onions, and pickles. You can also try it straight with the raw onions and eat it by holding the tail. Koninklijk Paleis Amsterdam, Amsterdam’s Royal Palace, (above photo- top left) is located in Dam Square. It began as a city hall and opened its doors in 1655. Napoleon’s brother, Louis Napoleon, made the hall his residence in 1808 and had the interior transformed into a lavish palace during his short stay there. After a long period of disuse, the building was sold to the State of the Netherlands in 1935 and is now used by the Royal House. We only walked through the square, but the palace is open for tours inside on select dates of the year from 10-5. Next to the Royal Palace is the Nieuwe Kerk (New Church- above photo bottom left). It is no longer used for church services, but houses royal ceremonies, special exhibits, and other events. Across from the Royal Palace and Nieuwe Kerk is the National Monument, a 1956 World War II monument (above photo right). We stuck to mostly street food and cafés during our trip since Claire is at a particularly difficult age for restaurants. Through the week, the kids were doing so well that I decided to make reservations for lunch on our last day. 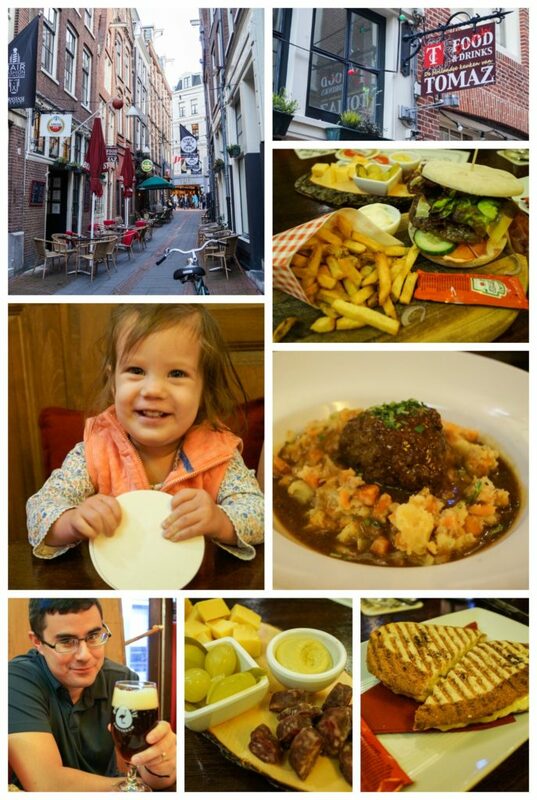 Tomaz is just a 5 minute walk south of the Royal Palace and serves traditional and contemporary Dutch food. I am so glad we decided to go. The meal was a highlight for me and it was nice to just sit and enjoy ourselves for a bit. I ordered the DAMburger met huisgemaakte frites ( Hamburger with lettuce, tomato, cucumber, onion, bacon, cheese, Amsterdam pickles, and homemade fries). Chad had the traditional Hutspot (Mashed potatoes and carrots) and Claire ate a sausage and cheese platter. Evan had the Kaastoasti (Grilled Cheese). 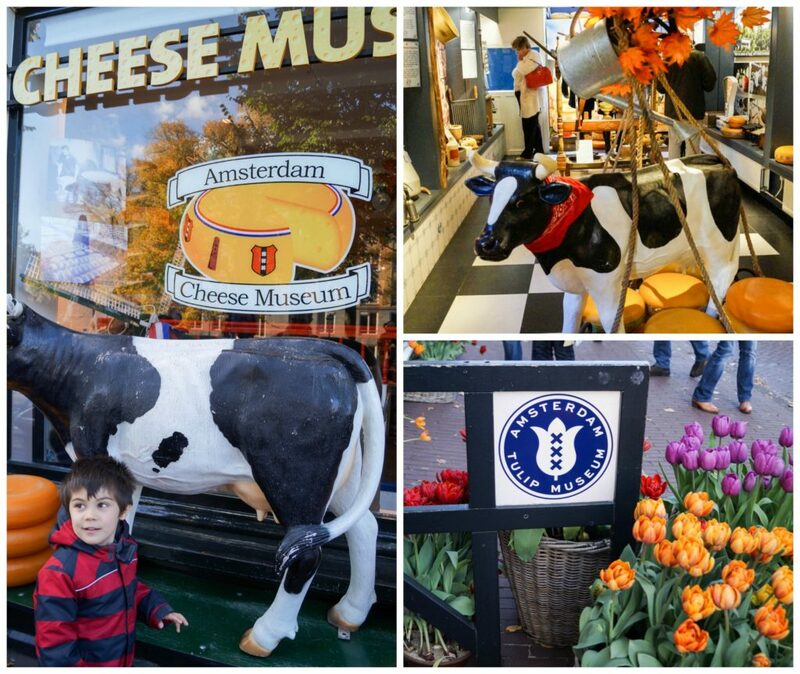 Both kids were quite fond of cheese in the Netherlands and its abundance. While the public transportation system in Amsterdam is very efficient, the center of Amsterdam is small enough that we actually spent a lot of time walking. This way we were able to enjoy the sites of the city and the canals in particular. After a week of cold, cloudy weather, the sun actually appeared on our last afternoon in Amsterdam. It was perfect for strolling along the canals and visiting the different shops. In the photo above, you can see the house with one of the narrowest façades towards the right- Singel 7. It is barely wider than the front door. I loved seeing all of the unique styles of houses along the canals. At the corner of Brouwersgracht and Herenmarkt, we came across a great little playground. Evan loved the large sandbox filled with trucks and building tools and Claire enjoyed the baby swing. One of my favorite canal photos- along Brouwersgracht. 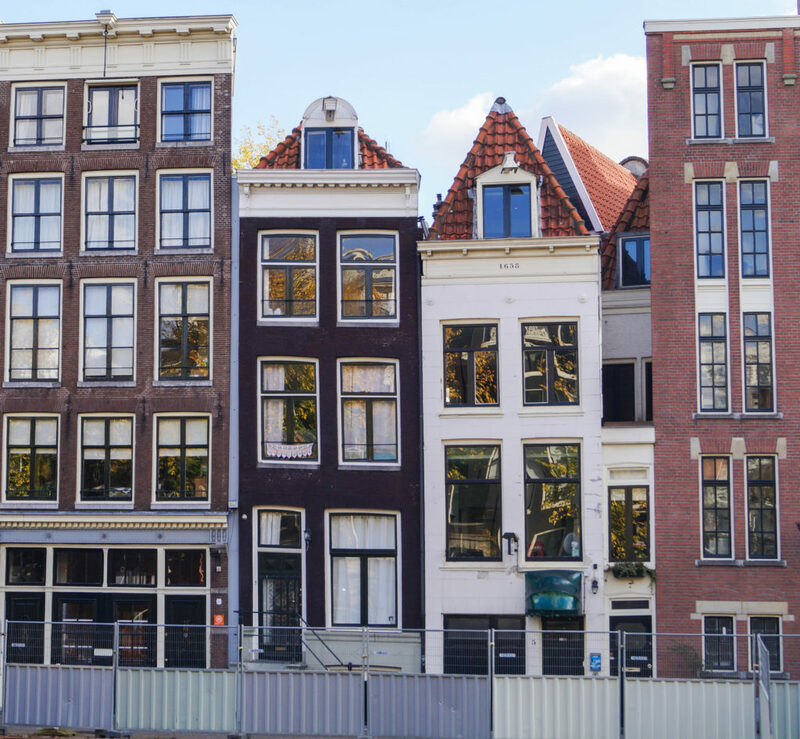 The Anne Frank Huis (Anne Frank House) is another one of the most visited sites in Amsterdam (third after the Rijksmuseum and Van Gogh Museum). 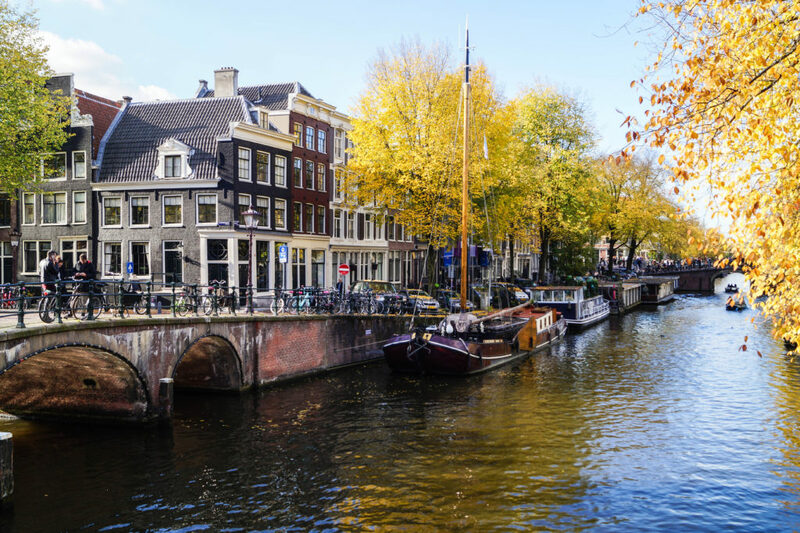 It is located on Prinsengracht 263 and would be easy to accidentally pass if it wasn’t for the hordes of people. There is a small sign on the house noting its location before reaching the museum entrance. The museum is located in the original house and the one next door (Prinsengracht 263-267). The Anne Frank Foundation was created in 1957 to preserve the house, turning it into a museum that opened in 1960. Photography is not allowed inside. 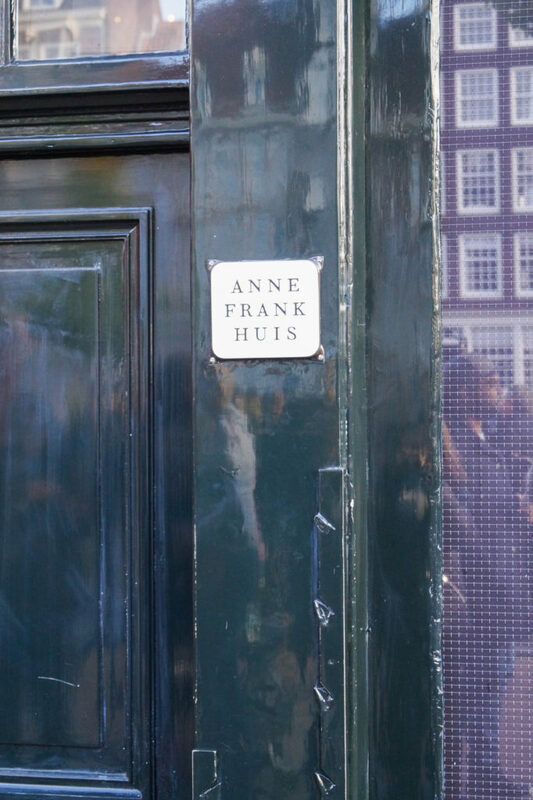 The self guided tour takes you through the rooms of the house and into the 500 square foot Achterhuis (secret annex) behind a moveable bookcase where Anne Frank hid with her parents, sister, the Van Pels family, and Fritz Pfeffer for over two years. After they were captured in 1944, Miep Gies and Bep Voskuijl (who helped hide the families) returned to the room to retrieve their personal items, including Anne Frank’s diary. Otto Frank survived and published her writings in 1947 as Het Achterhuis– which is now on display in the museum. You can also see many of her top quotes displayed on the walls as you walk through the rooms now filled with historical documents, photographs, film images, and other objects (the original furniture has been removed). The house is open daily, except for Yom Kippur, from 9 am to 10 pm. Ticket prices are currently 9 euro for adults, 4.50 for children 10-17, and free for 9 and under. I kept my itinerary fairly flexible for much of the trip, but tickets definitely need to be bought in advance to view inside the house or try to enter later in the evening. They can be purchased online for specific time slots up to 2 months ahead of time (as a note: only purchase tickets directly from the Anne Frank House). I bought them about 6 weeks in advance and most were sold out 3 weeks out for an almost off-season time. If you don’t have tickets, you can wait in line after 3:30 pm. As we were leaving the house right at that time, we noticed the line went down the street and wrapped around the Westerkerk next door (photo above bottom right). The queue may close up to a couple of hours before stated closing time based on how long the line is. Strollers and bags are not permitted in the house. Strollers can be parked just inside the entrance (nothing allowed to be stored in it), but there is no place to store bags. We had a small backpack and Chad was able to flip it around and wear it on his chest. Keep this in mind before showing up with shopping bags, etc. The house is not wheelchair accessible and there are quite a few narrow staircases. Baby changing facilities are available in the restrooms. Allow roughly an hour to walk through the house. 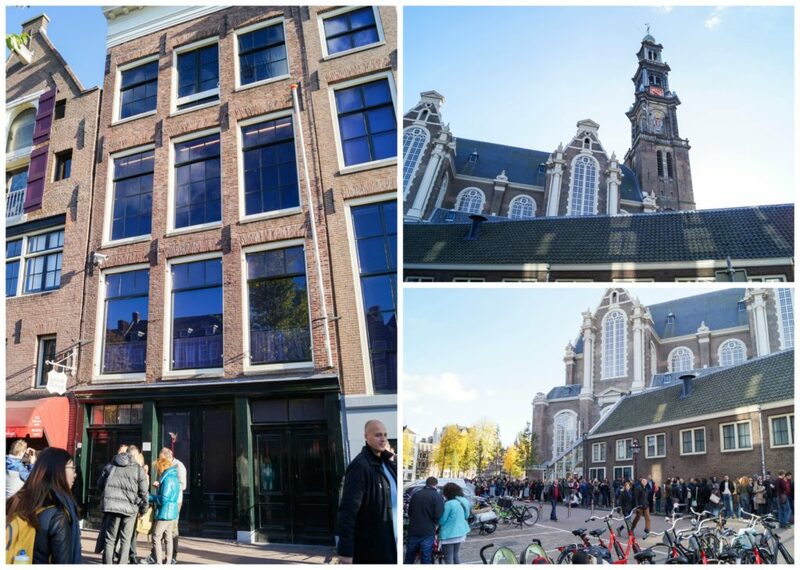 The Anne Frank Huis is located on the edge of the popular shopping district, De Negen Straatjes (The Nine Streets). There is plenty to find here from over 200 vintage and speciality stores to cafés and restaurants. Across the canal on the other side of Prinsengracht are two touristy shops- the Amsterdam Cheese Museum and Amsterdam Tulip Museum. Evan and Claire were particularly fond of the Cheese Museum and all the samples. The main floor has a variety of cheese available for purchase. Downstairs, there is some information on the creation of cheese and areas for “cheesy” photo ops. Another cheese store that has great reviews is De Kaaskamer on Runstraat 7. Unfortunately they were closed by the time we reached the lower part of De Negen Straatjes. 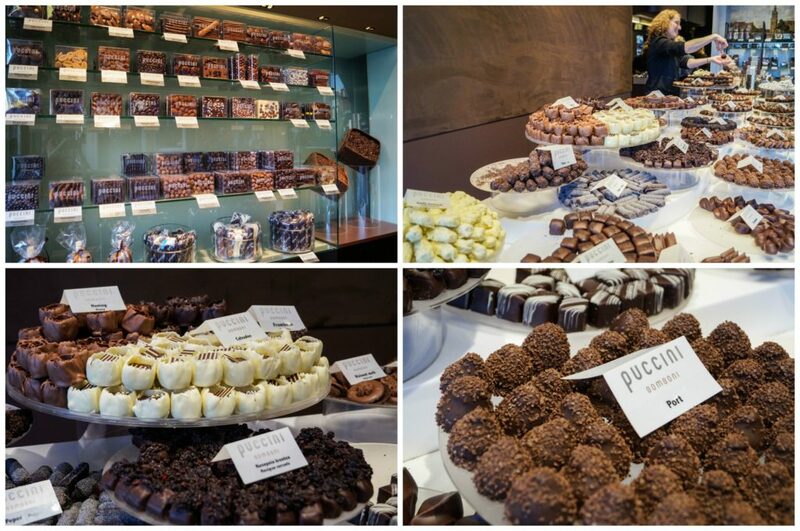 One of my favorite shops was Puccini Bomboni, a specialty chocolate shop at Singel 184. They have a variety of chocolates to choose from in some interesting flavors such as Fig Marzipan, Cognac, Amaretto, Gianduja, Lemongrass, Honey, Port, Raspberry, Cinnamon, and more. It was here that we learned that Evan actually does like chocolate, it just has to be very dark and not too sweet. I bought the topping for my Beschuit here. It is currently open Monday-Saturday from 11-6 and Sundays from 12-6. They have another shop at Staalstraat 17. 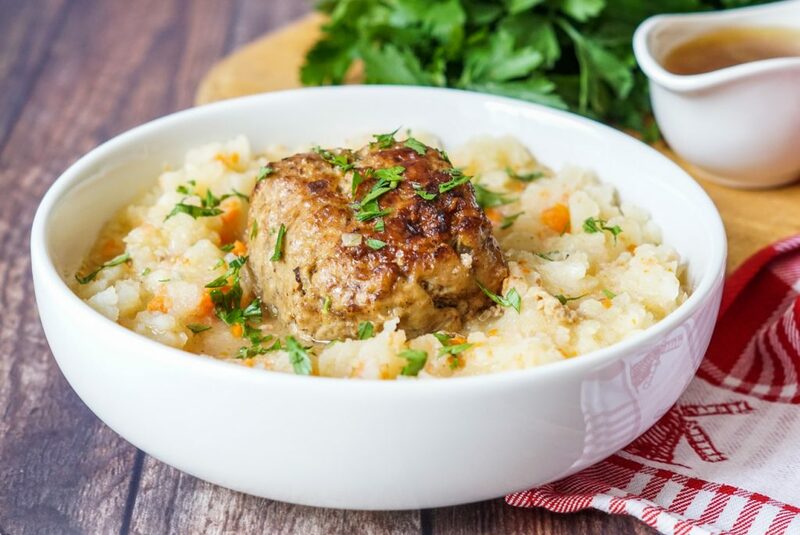 As the weather gets colder in the Netherlands, Stamppot is often served as a warming and comforting meal. There are many kinds and we came across a version called Hutspot met Gehaktballen during our meal at Tomaz in Amsterdam. 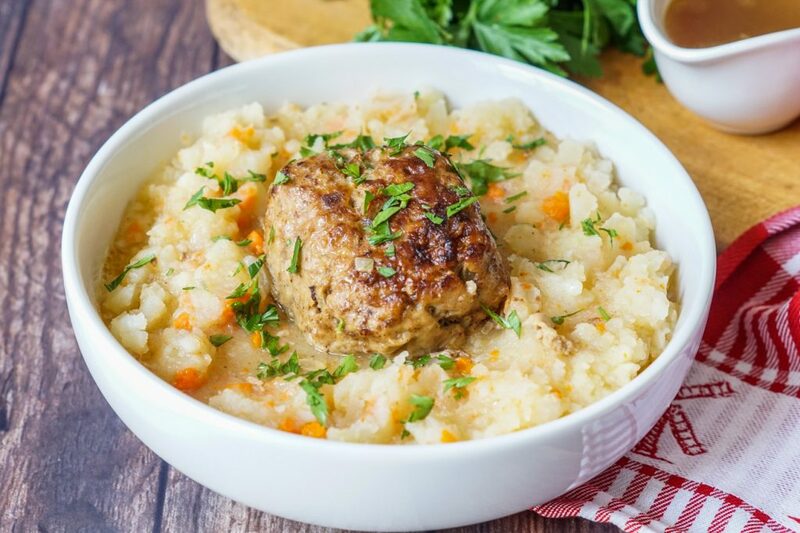 Hutspot (translates to hotchpotch) is a mashed dish of potatoes, carrots, and onions. It is generally topped with a piece of meat. I paired it with Gehaktballen (large meatballs), but Klapstuk (braised beef) and sausages are also popular. The Gehaktballen we had in Amsterdam were quite large, about 1/4 pound each. I used ground beef with an 85/15 ratio of fat. Don’t use lean. The fat with render and help add to the sauce. You can also use half ground beef and half ground pork. The meat is mixed with seasonings, soaked bread, and egg, formed into balls, then simmered slowly for about an hour until tender and cooked through. The sauce that develops is added to the meatballs and hutspot. The mashed vegetables in the Hutspot met Gehaktballen can be simply seasoned with salt and pepper or you can also mix in a little butter (1-3 tablespoons) and milk for extra flavor. Place a large pan that has a cover over medium heat. In a medium bowl, add the bread slices and cover with milk. In a large bowl, add the beef, onion, egg, mustard, nutmeg, salt, and pepper. Take the bread out of the milk, squeezing out the excess moisture, and crumble into the bowl. Discard the milk. Use your hands to mix the ingredients until just combined. Divide the mixture into 4 equal pieces. Roll each one into a ball and coat with the flour. Melt the butter in the heated pan. Add the meatballs and brown on all sides. Cover, reduce heat to medium-low, and simmer for 20 minutes. Flip the meatballs, cover again, and simmer for 10 minutes. Pour in the 1/2 cup water, cover, and simmer for another 20 minutes. Transfer the meatballs to a plate and add beef stock to the pan. Simmer until heated through, loosening up any pieces stuck to the bottom of the pan. Season with salt and pepper. While the meatballs are simmering, place the potatoes in a large pot followed by the carrots and onions. Pour in the water, cover the pot, and bring to a boil. Reduce heat to a simmer and cook until the vegetables are tender, about 20 minutes. Pour off the water, saving it if needed, and mash the vegetables to desired consistency. Add a little of the water or 1/2 cup milk if desired to make the mixture more smooth. Season with salt and pepper. Divide the mashed vegetables among the serving bowls. Make a well in the center of each and add a cooked meatball. Top with the beef sauce and serve immediately. Amsterdam is an amazing city, and it is so nice to see you enjoying it with you family. The food looks delicious, and certainly a welcome meal having had a busy day. I love all the veggies with the meatball. It has been over 30 years since I have been to Amsterdam. It is time to go again. I want to go to the Netherlands sooooo bad! It looks like such a wonderful place to visit and that bowl of comforting deliciousness has me hooked! Hearing how kid friendly all of your excursions were is making me want to go! The Anne Frank Museum would be really neat to see. 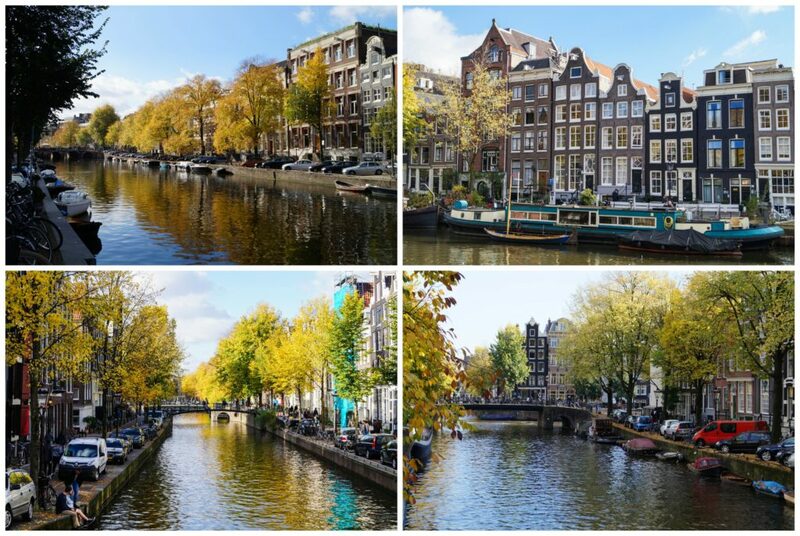 Amsterdam is beautiful and your photos are absolutely stunning! This recipe looks amazing 🙂 I’ll have to try it one of these nights! Wow! It sounds like you had a wonderful time there. I would love to see the Anne Frank house! As soon as you said 500 square feet, it made me sit back and think about their experience again. I need to go re-read her diaries. It’s a part of history that no one should forget. I thoroughly enjoyed looking at all your photos, the kids must have had such a good time! 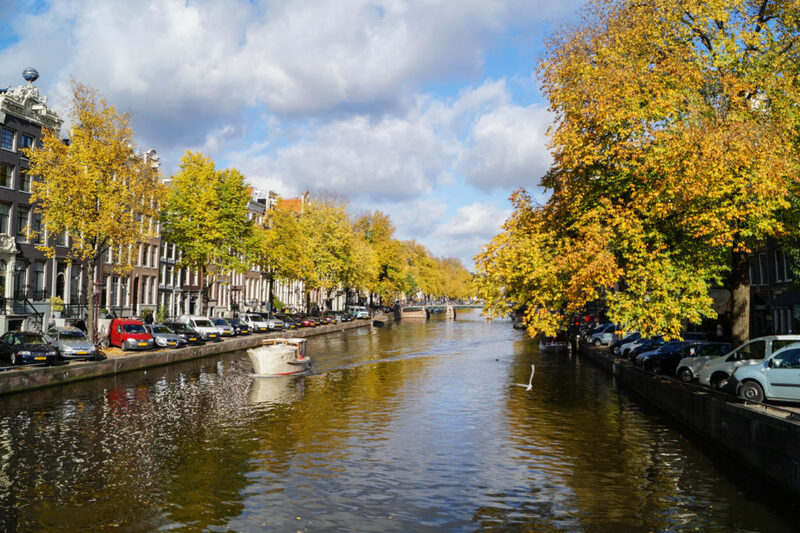 We love hopping over to Amsterdam for a long weekend and love spending time just walking around like you did. 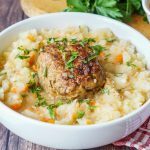 Your Dutch meatball stew looks wonderful! Amsterdam is one of my favorite places in Europe. This post brought back so many memories. I had an opportunity to visit Amsterdam last year, but was so scared to go alone! I was visiting my family and had a layover there for about 32 hours. At the end, I changed the ticket and met my husband for a road trip in South Africa. This kind of trips are better enjoyed with family; your kids are so adorable! What an amazing trip you have had. So many wonderful things for your family to experience and memories to be made. The recipe you shared also looks pretty darn delicious. Thank you for sharing your adventures! I loved reading this post as I’m a Belgian living in Amsterdam since a year. I know this city has so many amazing things to offer, but I’m never too sure what to visit with my 3 young children. Now I have plenty of ideas and I’ll definitely read your other Amsterdam posts. Oh, and the gehaktballen look amazing! Amsterdam is beautiful and so your pictures. I should try to make that recipe one of these days, it looks great!